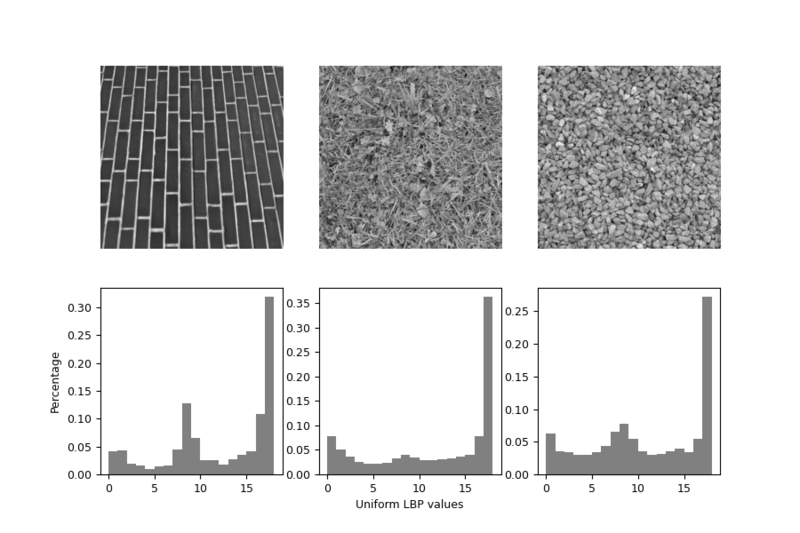 In this example, we will see how to classify textures based on LBP (Local Binary Pattern). LBP looks at points surrounding a central point and tests whether the surrounding points are greater than or less than the central point (i.e. gives a binary result). Before trying out LBP on an image, it helps to look at a schematic of LBPs. The below code is just used to plot the schematic. """Draw the schematic for a local binary pattern.""" # Draw the central pixel. # Draw the surrounding pixels. # Draw the pixel grid. The figure above shows example results with black (or white) representing pixels that are less (or more) intense than the central pixel. When surrounding pixels are all black or all white, then that image region is flat (i.e. featureless). Groups of continuous black or white pixels are considered “uniform” patterns that can be interpreted as corners or edges. If pixels switch back-and-forth between black and white pixels, the pattern is considered “non-uniform”. When using LBP to detect texture, you measure a collection of LBPs over an image patch and look at the distribution of these LBPs. Lets apply LBP to a brick texture. The above plot highlights flat, edge-like, and corner-like regions of the image. 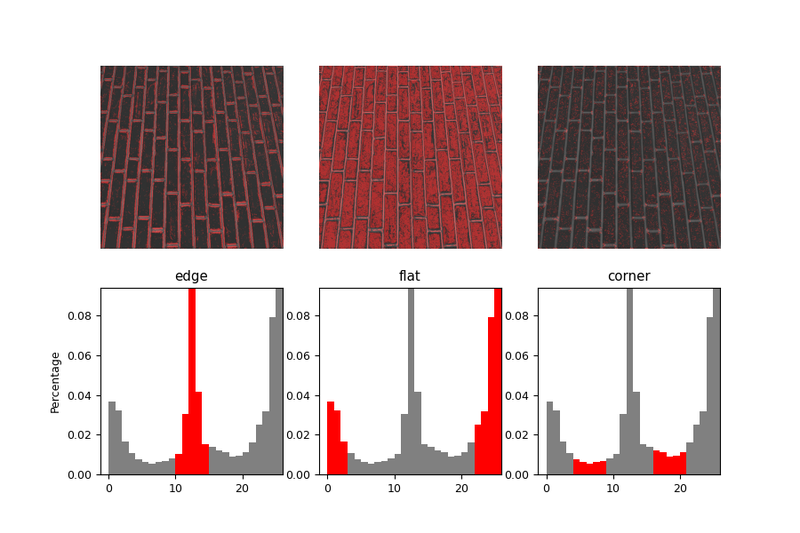 The histogram of the LBP result is a good measure to classify textures. Here, we test the histogram distributions against each other using the Kullback-Leibler-Divergence.